(NationalSecurity.news) Protecting our local police officers is a national security issue – and an obligation every civic-minded American, regardless of political affiliation or ideology, has a responsibility to fulfill. This is becoming even more apparent as a rise in anti-police militancy spreads virulently across our country. Movements like #BlackLivesMatter and other racialist causes populated by radicals who spew anti-police venom in public and on social media are contributing to this weakening of national security. How are these cop-hating movements likely to lead to a weakening of national security? Because targeting, attacking and killing police officers whose job it is to enforce our laws will eventually lead to unrest and anarchy as more of them leave the job out of frustration that no one has their back, or as they pull back from communities already endangered and on the brink of disintegration. Anarchy on the domestic front will make us weaker on the national front. In 2014, police deaths skyrocketed 24 percent, The Washington Times reported, noting that ambush-style attacks were the predominant leading cause of death for the fifth straight year. In all, last year, 126 officers were killed. Of those, 50 were gunned down, up 56 percent from the 32 who were shot to death in 2013. — On Sept. 1, Shannon Jaruay Miles was charged with killing Harris County, Texas, Sheriff’s Deputy Darren H. Goforth at a suburban gas station as he fueled his patrol car. Miles allegedly shot him 15 times from behind with handgun. — On Aug. 27, Officer Henry Nelson was shot and killed by Harrison Lee Riley Jr. in Sunset, Louisiana, after Nelson responded to a report that three women had been stabbed, according to Sheriff Bobby Guidroz of St. Landry Parish. — On Aug. 25, Louisiana State Trooper Steven J. Vincent died after being shot in the head day earlier during a traffic stop; suspected gunman Kevin D. Daigle was charged with first-degree murder. — On Aug. 15, fugitive ex-convict Garland Tyree opened fire on law enforcement officers, injuring firefighter Lt. James S. Hayes, after emerging from a Staten Island, N.Y., basement apartment where he had barricaded himself for six hours. — On July 25, Mark Anthony Estrada was charged with murder in the fatal shooting of Police Officer Scott Lunger in Alameda County, Calif., during a traffic stop. — On June 15, James L. Boulware, a gunman, was killed by a police sniper after he attacked a Dallas police station. He appears to have acted out of rage sparked by loss of custody of his son. — Police Officer Gregg Benner of Rio Rancho, New Mexico, was shot dead during a traffic stop; police arrested Andrew Romero, a known gang member, as a suspect in shooting. Following the shooting death of Michael Brown by police officer Darren Wilson – an act of self-defense as determined by a grand jury that led to days of violent protests and gave rise to “hands up, don’t shoot,” a myth perpetuated by Brown supporters – officers have said they live in constant fear of being ambushed, like two NYPD officers in December. And what’s worse, the intense scrutiny being placed on officers by the mainstream media and, yes, even racialists in the Obama Administration (including the President and former Attorney General Eric Holder, according to Milwaukee County Sheriff David Clarke, who is black), is causing them to pause – a dangerous development for the maintenance of civil society, as well as officers’ safety. Harry Houck, a consultant and former New York Police Department detective, told CNN that officers could be second-guessing themselves as scrutiny of the police increases. Or the lives of someone’s family. “With the increasing number of ambush-style attacks against our officers, I am deeply concerned that a growing anti-government sentiment in America is influencing weak-minded individuals to launch violent assaults against the men and women working to enforce our laws and keep our nation safe,” said Craig W. Floyd, chairman and CEO of the National Law Enforcement Officers Memorial Fund. None of this is to suggest that any police scrutiny is unwarranted, or that officers have not used lethal force inappropriately on occasion. But we have a system of justice for those rare instances, and they are rare; gunning down officers or attacking them while they attempt to keep order will not end well for the civil society, or the security of our country, which is already under rising threat from various sources overseas. This is a radical example, but consider the collapse of domestic civil society in places like Iraq and Syria. That has led to civil war and the rise of extremist groups like ISIS and an overall collapse of Iraqi and Syrian national security as well. That can happen in America too. But only if good people allow it. As citizens, we have a duty and responsibility to stand up for, and help defend, those who protect us daily from the barbarians at the gate – the thin blue line of law enforcement. It’s time to push back against the haters, the advocates of violence and the forces of civil unrest who believe that destruction of the system is the only way forward. 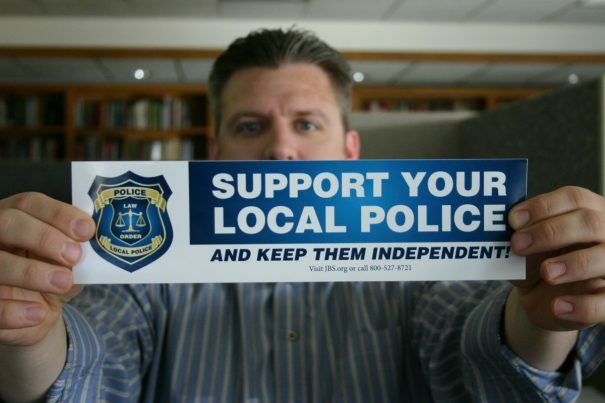 It’s time to defend our defenders – our local and state police officers. Our national security depends on it.